Show your love of the wine lifestyle with this Personalized Quarter Barrel Head Sign. Handcrafted of natural oak with metal ring. Can be personalized with Name, Initial, and Year. Can this sign be used outside? BEST ANSWER: Karen, I wouldn't recommend this sign for outdoor use as is. The wood on this item is not treated to stand up to all the elements, especially if you live in a place with high levels or rain & moisture. Is the personalization template standard? Or will we be able to create our own customized layout? BEST ANSWER: The Personalized Quarter Barrel Head Sign With Name, Single Initial & Year template is standard to this sign. As we customize many of our products, I suggest calling our sales department at 800.356.8466 and they can assist you with this. Thank you. BEST ANSWER: The Personalized Quarter Barrel Head Sign With Name, Single Initial & Year personalization is lasered onto the barrel head. 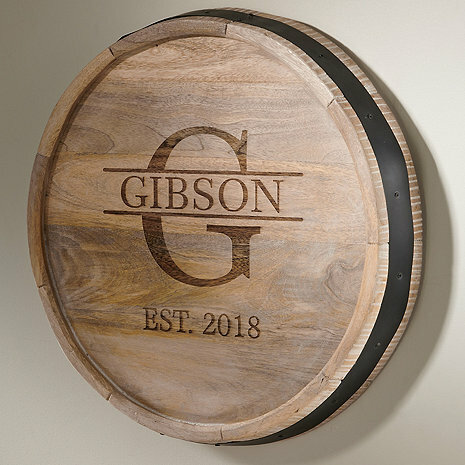 We offer the Personalized Deep Carved Quarter Barrel Head, item number 350 20 10 and the Personalized Rustic Barrel Wall Décor, item number 350 26 09 which are both etched into the barrelhead. Is this available with an attached wine bottle holder? Will the letter F look ok with this design? I love this type of wood, is there any way to custom make this same thing but a personalized cork holder display ? I'D LIKE TO SEE WHAT THE INITIALS "F" AND "K" LOOK LIKE ON THE QUARTER BARREL SIGN BEFORE I PURCHASE THESE. IS THERE ANY WAY I CAN PREVIEW THIS? UNUSABLE. Mounting is off center so that the letter and name point to the 10 o'clock position instead of straight up. This is a Xmas gift and I'm totally embarrassed. Waiting for problem resolution from your customer service. Looks great and adds charm to our bar! Just what we were looking for! I bought this as a housewarming gift for my husband for our seasonal home. I love personalized gifts and it made for a nice surprise for his bar. This would also be a nice engagement gift. Bought this as a surprise gift for the wife and she absolutely loves it. Everyone that has visited has also complimented how well done it is. We have it hanging above our wine fridge and it looks perfect. The lettering is faded and not as pronounced as image in magazine or website. Very pleased with the personalized barrel head. My first time ordering from Wine Enthusiast. I will definitely be ordering again in the future! Great quality and shipping was very timely! everything was done perfect. it looks great. Love this. This is my third purchase from you and very pleased with everything. It looks beautiful above my wine rack and fits in with my decor. Looks great. Professionally done. Was gift for our son-in-law. He loves it and he placed it on a prominent wall for all to see in his bar at home. Ordered this item from Katrina. She was very helpful & made Christmas shopping enjoyable. Very satisfied with your product. My son-in- law really likes this for his bar in new home. I liked the way it looks. Very nice piece. We've gotten compliments by anyone who sees it. I wish it were stained a little darker... doesn't look like an authentic barrel. But still very nice. Arrived and looks like the pic - however, this is not made of oak. I originally thought that it was plastic and called customer service, they told me it was made of Mango wood. Hard to review something that never arrived! Gave it one star because zero stars isn't an option. I ordered this on January 11th for a February 23rd wedding. It never arrived. I called about it today (2/27) and found out it won't be available until after April 11th. How embarrassing to have to explain to the couple that their gift will arrive two months after the wedding. To top it off, NO ONE CONTACTED ME TO LET ME KNOW! Not sure why they are still offering this on their website!